Posted on August 17, 2015 by Warin	in Boyz in the Hood, Compton, Dr. Dre, Ice Cube, John Singleton, N.W.A, Straight Outta Compton. This has been a big weekend for folks from the Los Angeles neighborhood of Compton. The film ” Straight Outta Compton” has grossed nearly $60 million at the box office this weekend exceeding initial expectations. The movie which profiles the rise and influence of members of the world’s most dangerous rap group, N.W.A., has reintroduced people to early West Coast hip-hop. It’s interesting to see where guys like Dr. Dre and Ice Cube are now in their respective careers compared to where they stood 25 years ago. As powerful as N.W.A. was in the early 90s, it wasn’t just the music that was influencing people, but film as well. In 1991 a young up and coming director had a major splash with the release of his film Boyz in the Hood that told the story of a group of friends trying to make it out of their South Central L.A. neighborhood. They guy who directed that flick was a man by the name of John Singleton. It was Singleton who also gave Ice Cube his first acting gig and it’s something that Cube is grateful for even to this day. 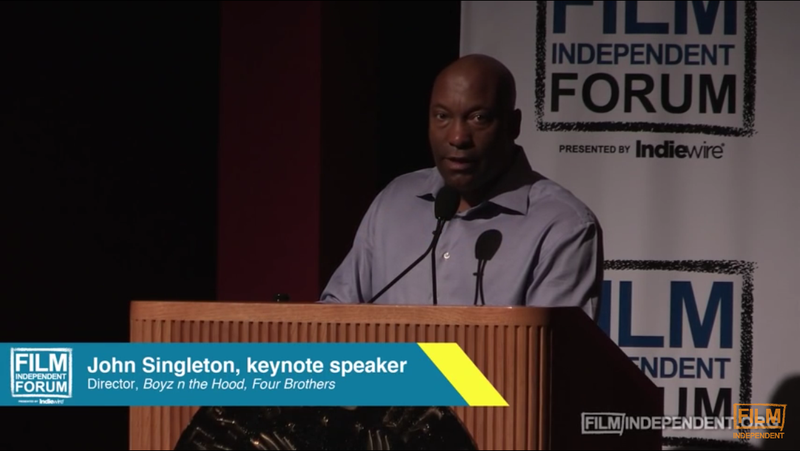 Check out the clip below to hear John Singleton talk about Boyz in the Hood and the impact N.W.A. had on him in this 2013 interview on Canadian television. Posted on June 27, 2013 by Warin	in California, Dr. Dre, Express Yourself, Ice Cube, NWA. Posted on March 19, 2012 by Warin	in Barbershop 2, Brown Sugar, Common, Ice Cube, Just Wright, LL Cool J, music video, Newark, Valentines Day, Women. Queen Latifah is probably recognized more these days for her films than her rap career, but her music continues to leave an impact almost 20 years later. Some of Latifah’s more notable film roles occurred with movies such as: “Brown Sugar,” “Valentines Day,” “Barbershop 2,” and 2010’s “Just Wright;” in which she starred opposite rapper, Common. Much like how Ice Cube, Will Smith, and LL Cool J made the transition from music to film, so did Latifah. Being that this is Women’s History Month (and today happens to be Queen Latifah’s birthday), I think it’s fitting that we revisit Queen Latifah’s earlier days when she was just one of a handful of female MCs by way of Newark, New Jersey. Her single, “U.N.I.T.Y.,” which was released in early 1994, spoke out about the derogatory names and mistreatment of women in society. It’s message continues to speak volumes even today.